In the Jagraon District of Punjab is a very blessed village called Kaunke. The Master of Miri Piri, Sahib Sri Guru Hargobind Sahib Ji blessed this village stating the diamonds would be born from this village. Guru Ji stated this when he rested at the village on his journey to the Sind region. When he stayed at Kaunke village, one of its resident Gursikhs, Bhai Hira Ji did keertan seva. Guru Ji was very moved by the keertan and at this point stated in a ‘Bachan’ that many more diamonds would be born here. So it happened, aswell as Bhai Hira Ji, Sardar Sham Singh Attari, the Great Mata Kishen Kaur Kaunke, Bhai Gurdev Singh Kaunke, and many countless young Gursikhs who have given all to the Sikh struggle, all were born in the village Kaunke. The list of names that stood by the mission and ideologue of Sant Jarnail Singh Khalsa Bindranwale from this village is long, but one name stands out. That name is Jathedar Gurdev Singh Ji. Bhai Gurdev Singh was born in 1949 in house of Bhai Gurdial Singh and Mata Chand Kaur Ji. Bhai sahib’s grandfather was Jathedar Totha Singh, who was a companion of Baba Nand Singh Ji of Nanaksar. Hence Gursikhi was a part of the family tradition. At a young age, Bhai Sahib was blessed with Amrit at the Sri Akal Takhat Sahib. Bhai Sahib’s worldly education was only up to level 6. However he continued to study in his religious study at the Damdami Taksal. He was tutored by Baba Vir Singh Madoke and Giani Inder Singh Badni Wale, both of whom were companions of Baba Gurbachan Singh Khalsa. From here Bhai Sahib began to do seva of katha of Sahib Sri Guru Granth Sahib and Dasam Granth. Due to the fact that Bhai Sahib inherited considerable land, his family needs were always satisfied, and therefore Bhai Sahib always did katha without selfish desire. In 1970, Bhai Sahib’s Anand Karaj to Bibi Gurmel Kaur happened. Before the Anand Karaj, Bibi Ji took Amrit and adorned a Keski. Bhai Sahib was a very strict Gursikh and followed the practice of Gurmat Bibek. This meant that would only eat food prepared by Amritdhari hands. Bhai Sahib was also strict in his Amrit vela, rising everyday at 2am. From 2am to 8am, Bhai Sahib would do his nitnem, and would never speak to anyone during this period. Bhai Sahib was very influenced by Sant Jarnail Singh. Throughout the Dharam Yudh Morcha, Bhai Sahib, along with his whole family would court arrest. Operation Bluestar in 1984, had a deep impact on Bhai sahib. From this period, Bhai Sahib in his katha openly started condemning Brahmin Authorities, and their devious practices. Due to the sincere nature of Bhai Sahib’s character, the parchar that Bhai Sahib did had a lot of influence on the sangat. Bhai Sahib was against all types of self-appointed Guru’s & Sant’s, and as a result of his parchar in the Jagraon area many deras, businesses of Brahminvaad, blind worship and ritualism were removed from every village and town. Due to Bhai Sahib’s parchar, the drug-ridden area of Jagraon, witnessed many Amrit Sanchaars, and kesri dastaars and black gatras could be seen everywhere. Once again the Malwa region strangled by drugs, witnessed a Khalsa revolution. At weddings, where previously dirty songs were heard, now Gurbani Keertan was heard. In buses, the Bollywood songs were replaced Dhadi Vaars and religious songs. Much of this social change was credited to Bhai Gurdev Singh Ji. As a result of this, in January 1986, Bhai Sahib was chosen to the highest Seva in the Khalsa Panth, the Seva of Jathedar of Sri Akal Takhat Sahib. These times were difficult, but Bhai Sahib did this Seva as a fearless General. It was only the first two days of Operation Black Thunder. Jathedar Ji’s first action was to remove all the Government agents dressed as Sikh youth jujharoos from Sri Darbar Sahib. Next he ensured that the corrupt kharkoos who were having langars in their rooms in the Darbar Sahib complex were stopped, and everyone was made to have langar only in the Guru Ram Dass langar hall. Throughout his period as Jathedar, Bhai Sahib ensured he had only from Guru Ram Dass langar hall to ensure the Maryada of Sangat and Pangat remained. At this time, the Kar Seva (building) of Sri Akal Takhat Sahib was happening. Jathedar Ji took control of the Golak to ensure it was not being siphoned off by unscrupulous characters. Bhai Sahib was completely sympathetic to the Khalistan cause, and felt that the Khalsa needed to fight for its independence. In his lectures, Jathedar Ji would say, those who have internal differences, kill innocent hindus, give threats like gangsters, they are traitors to the Sikh struggle and cause. He would often speak about the need to Sikhs to develop a revolutionary Spirit. In his Katha, Jathedar Ji would often speak against the ill’s of Punjabi society, and encouraged social change. In his period, he helped thousand’s of poor girl’s who were abandoned by their husbands because of the greed of dowry. Bhai Sahib would himself become involved in individual cases and ensure the girl’s were accepted back into their homes. As a result of this parchar, in the Jagraon area, social ill’s such as dowry, alcoholism, domestic violence were reduced dramatically. Such was the impact of Jathedar Ji’s sincere nature, that the population stopped taking their disputes to court’s and police stations. Instead they would come to the Kaunke village, to Jathedar Ji, where they felt they would get justice. The sweet words of Jathedar Ji would leave both parties walking away happy. As a result of this social change, the Police and other Sarkari (government) agents saw their incomes significantly decrease, as they were unable to get money as bribes or extortion from the disputes. They became dangerous enemies of Jathedar Ji, and started to plot against him. In 1989, some kharkoo Singhs fired on the Ludhiana headquarters of the RSS (a right-wing Hindu fascist group). Jathedar Ji’s enemies saw their opportunity. At that time, Ludhiana was under the control of an extremely vicious and brutal SSP called Sumedh Saini. To get Bhai Sahib to admit responsibility for the attack, he was hung upside down, and tortured for many hours. Then later on, Jathedar Ji was one again arrested and was falsely implicated in the Bidar attack. But after one year, Jathedar Ji was again released. Then on 19th May 1991, Bhai Sahib was again arrested and tortured. He was imprisoned for another 18 months. Jathedar Ji would never allow the sangat to bail him out, and always fought his cases with truth and full faith in Guru Maharaj, which always resulted in his release. In fact, the Government were often forced to admit in court that the charges against him were false. This led to great embarrassment for them. For the mud they slung at Jathedar Ji, he always came out whiter than white. The population witnessed the difference between the character of the Khalsa Singh, and the devious nature of the Brahmin authorities. As a result, the aura of Jathedar Ji’s revolutionary Khalsa character was a huge thorn for the Brahmin agencies. 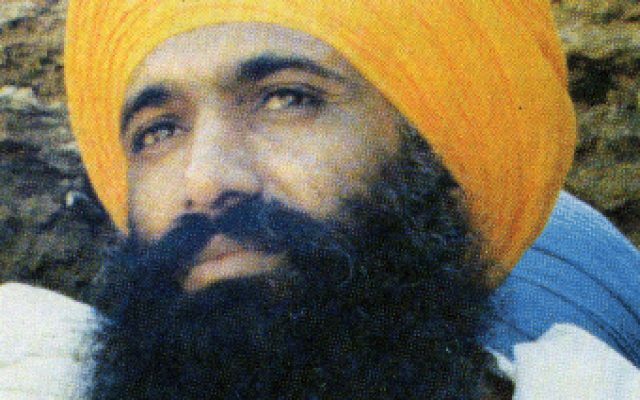 On 20th December 1992, the cowardly Police forces at 4am came to arrest the Lionheart Jathedar Gurdev Singh. However due to body of Bhai Sahib young nephew being at his house for cremation, they had to release Bhai Sahib after a few hours. Five days later, under the command of Inspector Gurdeep Singh, the Police arrested Jathedar Ji when he finished Katha at Gurdwara Sahib in the early hours. Bhai Sahib asked them if he could go home first, then he would accompany them. Bhai Sahib walked home, followed by the Police party, and many local villagers. Once he arrived home, Bhai Sahib did ishnaan (bathed) and changed his clothes, and then went and sat in the Jeep. The whole road was filled with villagers. Jathedar Ji rose to address them. In his sincere nature, he asked the sangat to accept his final Waheguru Ji Ka Khalsa, Waheguru Ji Ki Fateh!!. Jathedar Ji was aware his time had come, and sweetly accepted the will of Akaal. Fearing the wrath of the sangat, the police quickly sped off. Jathedar Ji was tortured by the infamous and brutal Head of Jagraon Police, Swaran Gotna. Thus named for his use of the ‘Gotna’ in interrogation. This is a large log placed on the legs and rolled up and down them while two policemen stand on each side. He was assisted by Harbhagwan Sodhi and Inspector Gurdeep Singh, who today is a DSP in the Punjab Police. Then Jathedar Ji was further interrogated by CIA staff of Jagraon. In them days, a rumour spread through the villages of Jagraon. When Swaran Gotna swore at Jathedar Ji and told him to remove his Kirpan and gatra. Jathedar Ji in a state of Bir-Rass (warrior spirit) replied, ‘Stop, who are you threatening. This is worn because of the many Great Sacrifices.. A dog of the Brahmin like you will never understand its value..’ A scuffle broke between the two and it took 5-7 commandos to restrain Bhai Sahib. His Kakkaars were removed and he was mercilessly beaten and tortured. Jathedar Ji due to keeping Gurmat Bibek would never eat at the Police station. Everyday his family would bring prepared meals for him, but the brutal Police always refused to let him eat, and sent the family away. As a result, Bhai Sahib health became weak, but he never compromised of his religious principles of Gurmat Bibek. In a nearby village Chaharchuk, an old bibi stated she had gone to the Police Station in relation to a case. She saw Bhai Sahib and he was in a very fragile state. At this point local villagers and Akali Leaders began putting pressure for Jathedar Ji’s release. When local villagers with Akali leader Captain Harcharan Singh Rode met with Police officials, they were told that Bhai Sahib would be charged and sent to prison. However on 1st January 1993, Swaran Gotna got his revenge. As a result, on the 3rd January 1993, the newly appointed SSP Harinder Chahal stated to newspapers that Bhai Sahib was leading them to the cache of arms used by militants, when on there way they were attacked. He said Bhai Sahib had escaped. However everyone knew that these stories by Punjab Police were always made up. In reality, Bhai Sahib was Shaheed on 1st January and thrown into a river. Anger grew throughout Punjab as the news of Jathedar Ji’s Shaheedi spread. Panthic Leaders throughout the world gathered at the bhog. However the Police and Army sealed off Kaunke village. Even the photographic cameras of the press were broken and removed. Akali leaders in attendance were beaten with lathi’s (wooden sticks). Even the highly dubious Akali leader Parkash Badal demanded an investigation into the murder of Jathedar Ji, but decades on, nothing has happened. Whenever the family raises the issue, many more innocents became victims of Police excesses. Through infiltration of dubious people, fear, threats, and bribery, the case is always held up or shelved. Even Jathedars Ji’s young son, Hari Singh was not spared. A false case of a bomb explosion was placed on him, even though on that day he was at school, and the register confirms his attendance, which eventually led to his release. Bhai Sahib’s elder son, Bhai Ram Singh was also picked up and tortured by Police on many occasions. The Akali party fought the next election stating it would investigate the period of 1984 onwards and produce a white paper. It won the election by a huge landslide, but Badal soon forgot every promise and used his time to expand his own wealth. When Bhai Sahib’s family approached the Akali party for a full investigation, Police Officer Tiwari held an investigation. However just as the report on the investigation of the massacre of the 13 Singhs in 1978, the report of the murder of Bhai Sahib mysteriously disappeared somewhere in Badals administration, and was never seen again.